Partly through poor planning and partly due to my fridge being surprising full at the moment, I don't have a beer cold for the European Beer Challenge tonight. This was going to prove problematic I thought, however after scouring the fridge I found some of my favourites tucked up towards the bag and an idea struck. Why not visit the debate sweeping the beer world recently; the bottle versus the can! I am a big fan of beer in a can. 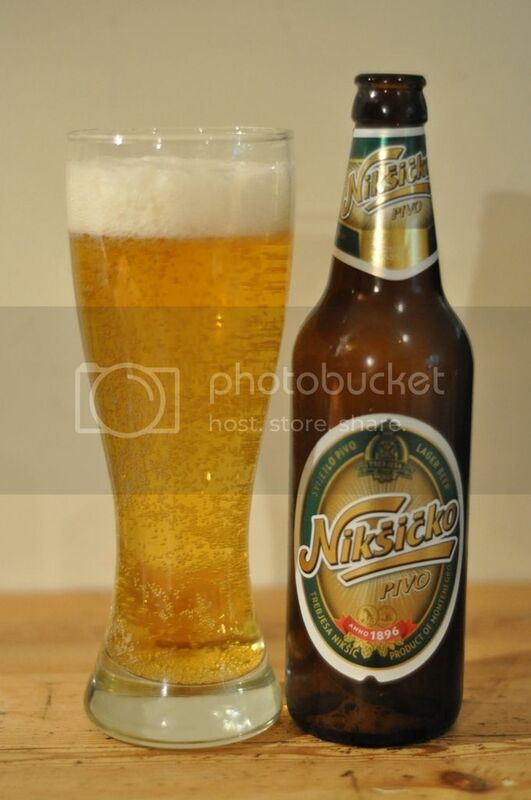 Living in Australia you have to be if you want the freshest tasting European beers. Can's have a tendency to protect the beer better from UV light rays and temperature changes than a bottle. This in-turn leads to better tasting beer on the whole when compared to it's bottle equivalent, I know there are sceptics out there but trust me, by the end of this I hope to have converted some of you to the can, obviously where it is available. 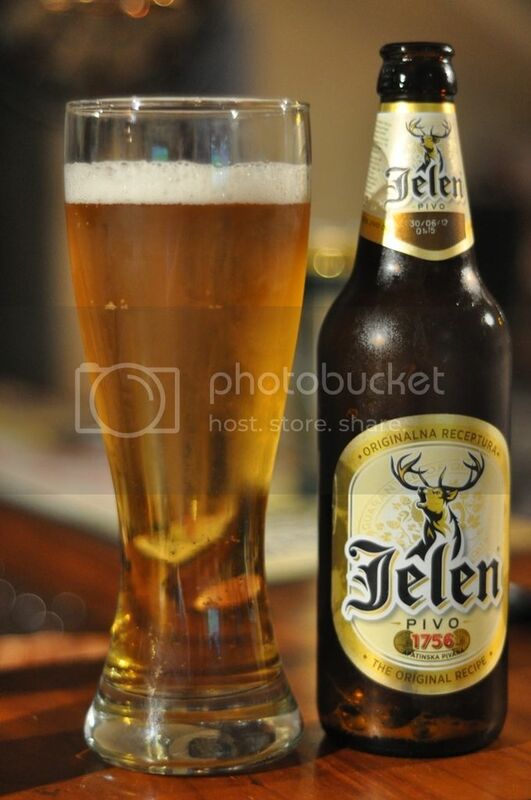 The two beers that I will compare have both already been review on this site, Jelen in the form I usually find it; Can, and Niksicko in it's traditional bottle. On my last trip to the beer store, I found Jelen in a bottle and Niksicko in a can and naturally had to try them, and tonight's the night! Both of these beers are from Montenegro and judging by the brewing dates they have all been brewed within 2 weeks. This beer should all be the same level of freshness and it all probably came over on the same ship, meaning conditions we can assume were the same. So firstly to the Niksicko, we took this photo in the corner of the room and then strangely switched to the bar top, oh well. This photo of the bottle looks eerily similar to the one for the original review at least the beer pours the same out of the bottle. lovely golden colour. The head is noticeably bigger on the can beer and on that fact alone I am giving the appearance award to the Niksicko Can. I can't split them on smell, quite honestly I can't split them, they smell exactly the same. Which quite frankly is a good sign, as in an ideal world there should be no difference, no matter what the vessel of choice is. And finally the all important taste test. This is a very simple decision for me, despite appearances the can beer tastes fresher. The carbonation is tighter and the beer certainly hasn't beer skunked, which I'm not so sure I can say about the bottle. The hops are much more noticeable in the can. In my mind the can is clearly the better vessel for Niksicko, not only does it taste better but you can fit more of them in the fridge! 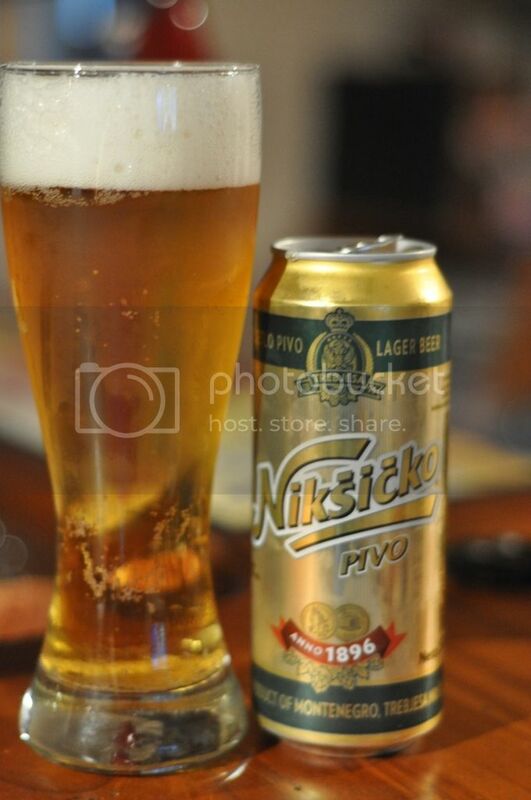 If you have the option buy the Niksicko can. 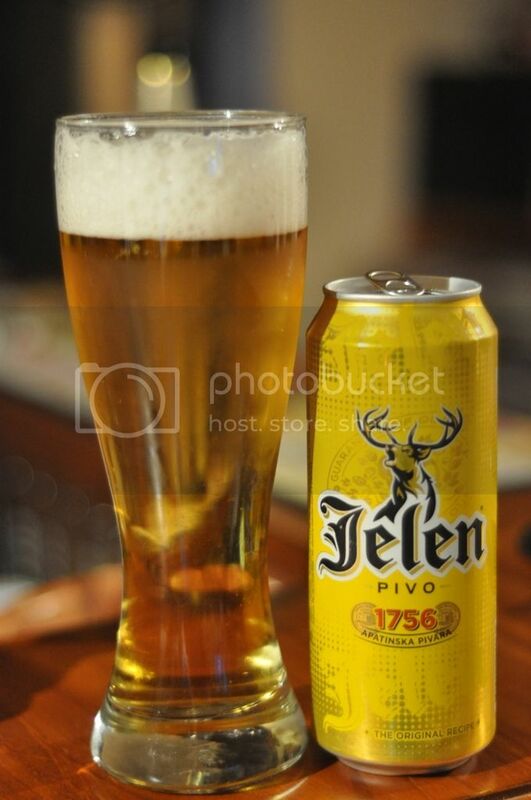 And now to the Jelen, I'm slightly nervous about this one, as I've grown so attached to my yellow cans that I almost couldn't bare it if the bottle got up. I'm reasonable confident though after the resounding success of the Niksicko can. 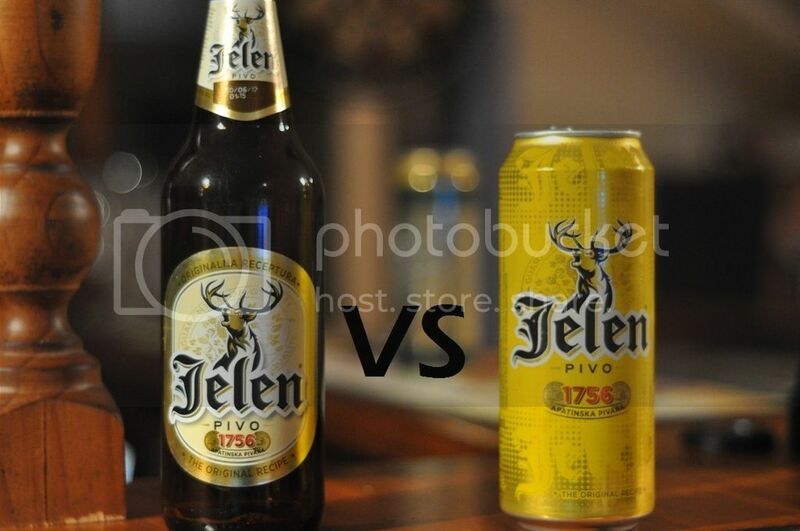 Firstly though, is the Jelen stag the best beer mascot in the world? I'd love to hear your thoughts and suggestions. 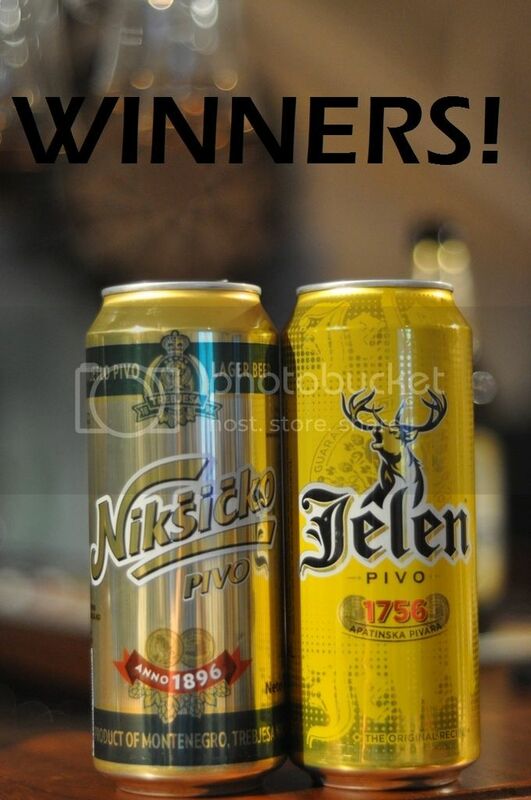 I think it's reasonably fair to say that the can wins the appearance hands down! It has more carbonation, a lovely big white head and the typical golden colour. The bottle is very disappointing, less than 1 finger of head really lets down a great beer. Unlike the previous beer I can notice a slight difference on the nose. The Jelen bottle appears to be thinner than the Niksicko bottle and it appears to have suffered a little on the boat ride over, another victory to the can. The taste was again noticeably in favour of the can. The bottle had definitely suffered from some minor skunking on the trip to Australia. The carbonation was lower and the flavour just wasn't as intense as that of the can. This can tasted better than any of the can's in my previous slab, I don't know if the importer has changed or if the temperatures were kinder on the way over this time, but for whatever reason the can was brilliant! All those who I have given this beer will agree it is an excellent beverage, get out there and support it but only in can form! This is one of the beer industries biggest debates at present. Can beer has long been seen as the inferior cousin to the bottle. However this attitude is changing as some microbreweries are now choosing to can their beer rather than bottle it. The main reason that canned beer is looked down upon in my opinion is the beer that goes in it. The beer is not damaged by the can as many people claim, the beer is damaged before it goes into the can. The metallic taste people complain about is most likely a by-product of the vat in which the beer was produced, and the can is just protecting that flavour more than the bottle does. Basically the can preserves what the beer tastes like on tap, better than a bottle can! Obviously higher alcohol beers, and thicker brown glass can survive travel better. If you have the option of bottle or can, for imported beers, buy can!